An underground sprinkler system will make it downright easy for you to water your plants and lawn. By just turning on the tap or by just a touch of the button, you can rest easy knowing that the sprinkler will cover all areas that need to be watered so there’s no room for yellow patches to appear. Installing this type of sprinkler system, however, can set you back thousands of dollars. Repairs can be difficult and a regularly watered lawn will require even more mowing than usual. It’s no wonder then that many homeowners are scrambling for affordable alternatives to an underground sprinkler system to keep their lawn lush and green all year-round without breaking their budget. Drip irrigation is a very popular method for watering plants and crops. You can set up a drip irrigation system along the border of a garden to effectively provide all of the water that your plants will need. This type of watering solution drips out water a little at a time throughout the entire day. This provides all of the irrigation that your plants need in the healthiest way possible. Many plants thrive using this method. Getting water consistently throughout the day is preferable for certain types of plants and crops. Setting up this type of drip irrigation system is simple enough, too. It should work excellently to make your plants stay healthy all season long. The problem with this solution is that it really doesn’t work quite so well for lawns. If you are looking for a sprinkler system that will work well for keeping your lawn healthy too, then you will want to look elsewhere. This simply isn’t going to be a method that will help your lawn all that much. It can work a bit for smaller lawns, but lawns that are larger than that will simply need another solution. This method of watering your plants and crops is really good overall. If you have a small garden that you want to water, then you should be able to set up a drip irrigation system rather easily. It will drip out one drop of water at a time and will keep your plants healthy. It’s a great watering method that works as a handy alternative to underground sprinkler systems. This method is really not going to be viable if you want to water your lawn. It might work on a small lawn, but lawns that are larger will be impractical. Depending on the size of your property, you may not be able to make use of a drip irrigation system quite so easily. You’ll need to examine your personal needs and see if they match up with what the drip irrigation can provide. Manual sprinklers may wind up being able to replace your underground sprinkler system just fine. The advantage of the underground sprinkler system is that it can deliver the water closer to the roots. This is certainly beneficial, but that doesn’t mean that traditional sprinklers can’t do a good job. It should be easy to turn on your sprinklers whenever you need to water your gardens or your lawn. The sprinklers will be able to provide your gardens and your lawn with enough water. If you space out a few sprinklers in the proper fashion, then they should be capable of watering your entire property. As long as you understand how much water certain plants need, you should be able to do well using these. You can even set up manual sprinklers to work on a timer if you would like to. You can buy manual sprinklers that work in different patterns, as well. Some of them will spray vertically, and others will oscillate to throw water at different areas. There are sprinklers that are meant to cover circular areas and ones that cover square patches of your lawn. They’re really quite versatile overall, and you’ll love owning one if you decide to give it a shot. Generally speaking, manual sprinklers are a lot more affordable than underground sprinkler systems. This is going to be a more practical solution for people who are on a budget. You’ll be able to get your lawn watered and your gardens are taken care of without having to worry. It’s a good system that will work well for your needs without harming your overall budget. This is a lot more affordable than an underground sprinkler system would be. You’ll be able to water even a fairly large property, as long as you spread out the sprinklers effectively. These sprinklers can even be set on timers so that you don’t have to turn them on yourself. It’s an easy solution to your watering problems. These sprinklers won’t be able to deliver water to your plants at the root. This shouldn’t be a big issue in most cases, but it may not be quite as desirable as the underground sprinkler system. People who are growing crops may prefer a different solution. One solution that wouldn’t require you to buy much of anything is to go ahead and water everything yourself. This method could either be the best way for you to go or completely impractical, depending on your situation. If your home only has a modest garden area and you aren’t growing all that many crops, then you may be better off just watering everything yourself. Those who have large gardens with a lot to water may find this idea to be a huge inconvenience, though. If you have a really large property, then the likelihood that you will have the time to water everything on a schedule is slim. This may make it so that you will require some type of automatic sprinkler system in order to ensure that everything stays healthy. It really does depend on your personal situation. If your property necessitates a sprinkler system, then you will want to go that route. 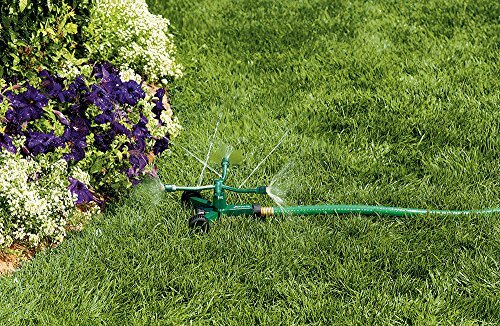 For people who have small to medium-sized properties, manual watering is a good idea. You will be able to control how much you are watering everything, and this can sometimes turn out better than most irrigation systems. It can be difficult to find the time, but if you make enough effort, everything will turn out okay. Think about this as an option if you simply cannot fit a sprinkler system into your budget. There are a few ways that people generally go about watering their lawn and garden areas manually. You can use your garden hose to try to reach as far as possible. You may also wish to water more gently using a watering can. This method is recommended for when you want to water specific plants in your garden area. The hose is going to be preferable for watering the lawn, of course. You will be able to avoid spending money if you decide to go this route. This can be the most cost-effective way to water everything that you need to. You’ll be able to make the decisions about what needs more water while you are in the moment, too. It allows you to be more accurate with your watering, even if it does take a lot of effort. This method is going to take up a lot of your time. You will have to get up and water everything yourself. It may take more effort to accomplish this than you are willing to give. Depending on the size of your property, watering everything manually may not even be a practical solution. If the reason that you are avoiding purchasing an underground sprinkler system is due to the cost, then you could decide to make your own. This DIY option is only recommended for people who have some knowledge of how to build things. This is going to involve purchasing sprinklers and pipes in order to mash them together to create a makeshift underground sprinkler system. It isn’t the easiest thing in the world to do, and it will likely not turn out to be quite as sturdy as the commercially available options. Even if you are an excellent builder and are very crafty, it can be difficult to get the results that you want with this method. There are some people who have had success with building their own underground sprinkler systems, but you’ll likely have to perform maintenance from time to time to keep things going. If you are willing to put in the work, then it is certainly something to consider. Many people simply will not want to have to go to the hassle that this method would require. Underground sprinkler systems are great, and they can certainly be useful for crops as well as large gardens. If you can make a DIY version a reality, then it will provide you with good results. It will lack some of the conveniences that are associated with the professional models, though. You need to weigh your needs against the cost of purchasing a commercially available model before moving forward. This method could be very inexpensive in comparison to buying an underground sprinkler system at retail. If you have the know-how, then you should be able to save yourself some money by spending some time making your own sprinkler system. This allows you to customize everything to suit your needs to a tee. The more effort you put into designing it, the better it will be. This may wind up being a bit of a time-consuming project. Aside from this, the likelihood of this DIY underground sprinkler system turning out as good as a commercial model is very slim. It is likely that you will have parts break down over time, and you will need to perform regular maintenance. This method may be more trouble than it is worth for some people.